Andrew graduated from the University of Western Australia in 1991. He is dually qualified in the disciplines of Radiology and Nuclear Medicine. He completed his specialised medical training in 1994, his radiological training in 2000 and his Nuclear Medicine Physician’s training in 2002, which included a fellowship position at Peter MacCallum Cancer Institute in Melbourne. In 2002, he took up a position as Nuclear Medicine Physician at Sir Charles Gairdner Hospital working as both a Nuclear Medicine and PET Physician. He has also held positions as Radiologist and Nuclear Physician at Royal Perth Hospital and in private practice. 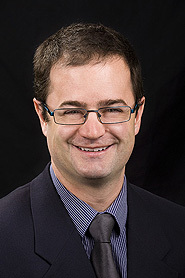 In 2008, he joined Perth Radiological Clinic as both a radiologist and nuclear physician and he is currently managing Partner of Perth Radiological Clinic’s Nuclear Medicine Service. Peter MacCallum Cancer Institute, Melbourne. Nuclear medicine and PET. Nuclear Medicine Physician, Dept of Nuclear Medicine & WA PET Service, Sir Charles Gairdner Hospital. Early prediction of response to chemotherapy and survival in malignant pleural mesothelioma using a novel semiautomated 3-dimensional volume-based analysis of serial 18F-FDG PET scans: Francis RJ, Byrne MJ, van der Schaaf AA, Boucek JA, Nowak AK, Phillips M, Price R, Patrikeos AP, Musk AW, Millward MJ: Sept 2007: J Nucl Med; 48(9): 1449-58. Epub 2007 Aug 17. RANZCR, Annual Scientific Meeting, Perth, October 2010: V/Q Scan in PE – Current Role and Future Directions. Lecturer: Cross Sectional Anatomy Course for Nuclear Medicine Physicians; 2006, 2007 and 2008.